Stock product - detailed vector illustration - Isometric Tiles Collection - Fishes 01 - created by Aurielaki. Image formats EPS AI JPG. SKU: Fishes-01-Tiles-Isometric-AurielAki. Categories: Food Infographic, Isometric Building Icon. 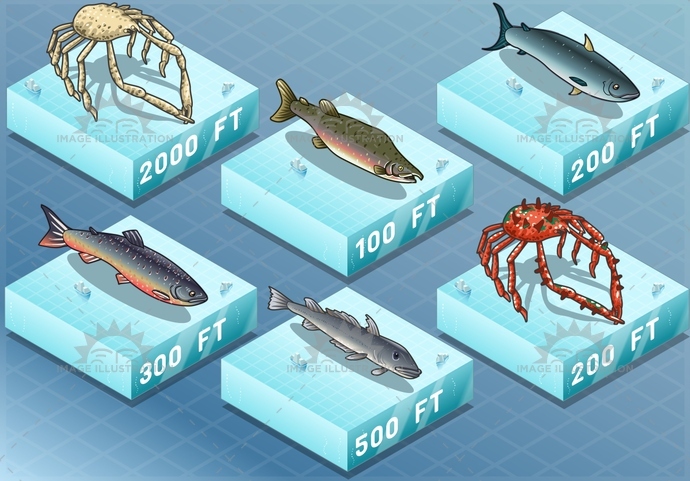 Tags: animal, background, char, climate, codfish, collection, crab, crustacean, depth, drawing, fauna, fish, fishing, food, freshness, isolated, isometric, marine, nature, ocean, salmon, scene, sea, seafood, tuna, undersea, underwater, wild.